This Warm Layer Keeps You Warm for Exciting Winter Riding! Cold weather makes it difficult to get outside and be as active as we want but proper layering and the right gear can make the winter months something to be exciting to cycle in. Base layers for those who are unfamiliar, is the first layer of clothing you wear against your skin before you put on any other layers. It is the "base" of your gear and outfit. The job of the base layer is first to keep the sweat and moisture managed. 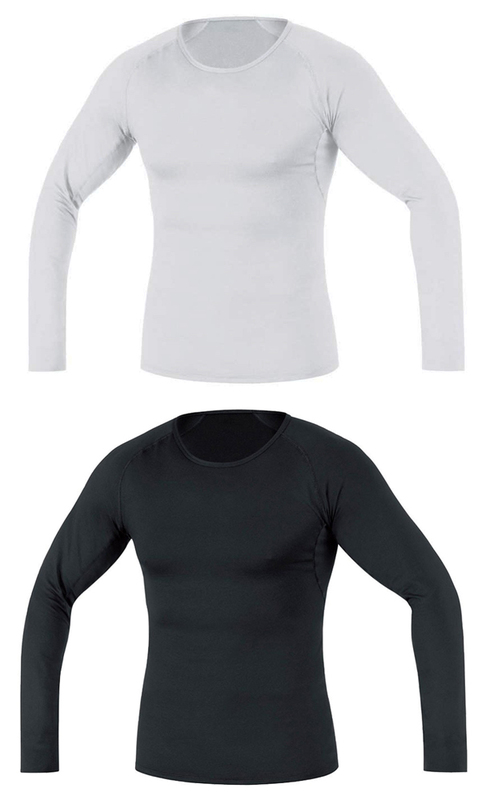 Base layers can be worn in hot or cold conditions, different conditions call for a different base layer. Cold weather base layers are designed to keep you warm and also dissipate sweat, keeping the rider warm though out their activity. GORE's Cold Weather Base Layers are perfect for any winter activity. The combination of an internal hydrophobic fabric with an external hydrophilic fabric pulls sweat away from the user's body keeping you warm, dry and your temperature consistent. GORE's goal designing their base layers is to create a garment with as few seams as possible because they can cause irritation. GORE uses flat-lock seams were seams were necessary. Flat locking seams cause less chafing and sit flat on the riders body. The GORE cold weather base layer also offers an extra-long back to give the rider full coverage while in the cycling position. Great Base Layer for Cycling, Skiing, Running, and More! Warm & Snug!